Well, not much of a surprise at all. We could see that one coming like a freight train across the Nullarbor. Option A, aka a flyover motorway bridge closest to the Basin Reserve, has been chosen as the preferred option by the NZTA, ignoring the daring alternatives of Option B (similar to A, but in an alternative “silly” position), and the myriad of other options considered, such as…. Oops, no, sorry, no other options were considered. Certainly not the request by WCC to have a tunnel rather than a bridge. Actually, the Council request for traffic in a tunnel all the way across the front of the Basin was rather impractical, and I don’t blame the NZTA for ignoring that request. As a political standpoint it made perfect sense, but as a realistic engineering exercise, it was a non-starter. Has anything changed on the Option A bridge now it has been unveiled at last? Well, a clip-on pedestrian walkway has been incorporated to the north of the flyover, but disappointingly little else. The cost has gone up, of course. There is still no sign of the proposed grandstand. There is no sign of proposed mediation. No sign of urban design improvements. No greening of the bridge. No inhabitation on the bridge, turning it into a living part of the city. No building under the bridge. No incorporating it into the urban fabric. Has NZTA learnt nothing from this exercise? They’ve learnt to split the cost of Option A with the Memorial Park cut and cover, while including the cost of the Memorial Park cut and cover in their estimate of the cost of Option X. And they’ve learnt the importance of either duping or conspiring with the Dompost to have their blatant spin printed without question. The DomPost’s frontpage photo (trees, pedestrians, two cars at ground level, only three on the flyover) was provided by the NZTA, though there’s no credit. Wow. So we’re really committing to about 90 + 85 (+/-15) + 462 (+/-30) = 637 million and all we’ll have to show for that is a quarter of a motorway and a permanently congested clusterf#$k for Te Aro. And when they duplicate the Terrace Tunnel, and Vivian St is perma-congested, resulting in Te Aro being gridlocked, what will they do? Duplicate the bypass at huge expense and duplicate the flyover? Force us to live with it? Come on, this is not well thought out! You know what impresses me most about these NZTA visuals? The trees. Take a look at that stunner of a horticultural specimen in the rendering above … it’s got to be at least 20m high to be in proportion to the flyover, so I guess those are all people from the far future (say, 2050 or so) given the rate at which the shrubbery normally grows. Perhaps there are no vehicles in the drawing because we’ll all be using flying cars by then. And the overhead artists impressions are just as entertaining – from the look of it, the Basin Reserve is merely a clearing in an enormous urban forest. 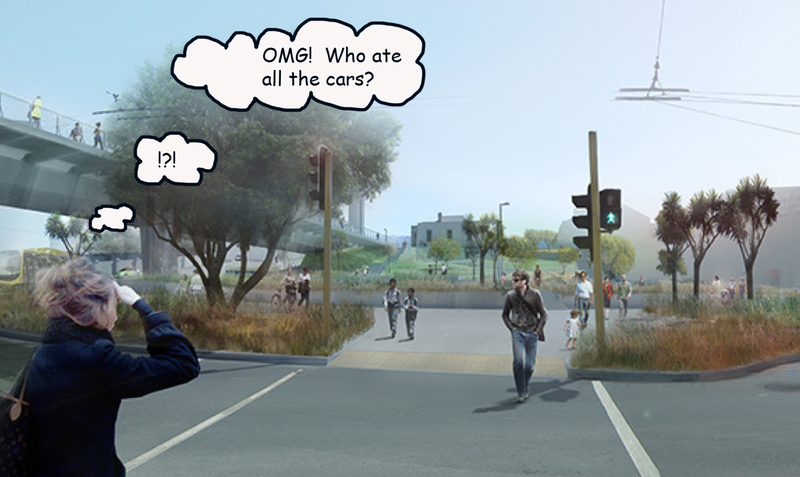 Although the artist rather dropped the ball when he got to the western side of Taranaki Street, at the bottom right of the render … the road then turns from beautiful tree-lined boulevard populated solely by youthful pedestrians into the actual urban wasteland of chain-link fence and asphalt that we all know as the Inner City Bypass. So overall, NZTA gets a big fat zero for design, but a ten out of ten for imagination. OMG! Seeing these semi-realistic realistic renders of the flyover gives me a picture of what Wellington might look like post armageddon. How dare they taunt pedestrians with a park space below whilst herding them onto the flyover amongst the machines. How dare they not make any comment on 2000 public submissions?? NZTA are making a great Troll habitat under the flyover. I am talking about the mythical monsters who are michevous and wicked who live under flyovers. If you make something on the top things live below. On top we have cars and poor pedestrians and the occassional cyclist. Underneath you will have trolls. The idea of actually having a building of two under the flyover is not a stupid idea. However I doubt this design would work with buildings under it. In fact all this design will do is increase car useage, trolls and our overseas debt- as NZTA can now borrow more to make these roads. What is the cost benefit ratio of this design? I doubt its even 1:1. I would assume it could be very low. If this is the case why not spend this money on a light rail system from the railway station to the airport? Just been observing the Stuff “live chat” with Peter Glensor, Cr. Morrison, Cr. Pannett and Cr. Foster. Something worth holding him (and his anonymous cricket fan mate) to. Yes, it’s going to be even more tranquil with an un-needed stand covering a THIRD of the flyover’s visual intrusion. Also adding to Kent’s artistic critique, is it just me, or in the render that shows the front entrance of the Basin, that it looks like it is a black and white image taken from the 50’s or something? How can they release drawings of the bridge when they havent finished designing it? Rod James of the NZTA: “the NZTA are starting to finalise its design for the bridge, and would work closely over the next few months with …” etc etc. I think the answer to that one is quite simple Lindsay – they’ve clearly had their designers working on it the whole time. The beautiful visuals that they released today certainly look like they have had a lot of photoshop work put in! What would be really good to know is what work NZTA did over the last few months, since public submissions closed. Have they really been doing any work on the “tunnel under the Basin” option that the Council asked them to? I suspect not. It’s probably a fair guess to say that they just tossed the Council’s request in the bin, and then sat down for the next few months to try to figure out how to spin it. >Have they really been doing any work on the “tunnel under the Basin” option that the Council asked them to? I hope not. If it was a good idea to dig a tunnel from one high point to another under a valley then someone would have done it already. We’d have a Millau Tunnel rather than a Viaduct. Plus the whole area being a swampy lagoon up until 150 years ago doesn’t help the concept. Surely this flyover is a pre-requisite for the light rail that everyone except me seems to want? I don’t see how you could put at-grade light rail through the middle of the country’s biggest roundabout without de-conflicting at least one of the traffic directions. The only alternative is for Mumbai-style traffic chaos and a whole lot of collisions between trams and vehicles. You’ve all forgotten some of the good things about this Flyover – trains can pass underneath them, cricket balls are less likely to hit cars up there than at ground level, and you get a good view down Kent Tce to the New World.